Figs are on my mind. This is the time of year when our fig trees ripen their fruit. Last summer our fig trees were loaded. A friend and I picked repeatedly, and had a steady supply of fruit for over a month. This year I’ve picked here and there since July, but haven’t gotten more than a handful at a time. The variety growing here when we moved in stays green right up until the moment of ripeness, when the fruit swells and turns a yellowish green. The inside is pink to red, depending on ripeness. This isn’t a super sweet fig, but is delicious broiled with a little shaving of salty cheese on top. I favor a Tuscano cheese, but anything in the Parmesan family of cheeses is delicious. This fig came home in a 1 gallon pot last summer. Its figs are brown. It started the season with small green figs, but lost them along the way. I’ve read that figs which stay green when ripe have an added protection from hungry animals who might take them as they ripen. Birds only peck at the figs I’ve left on the bush way too long so they split open. 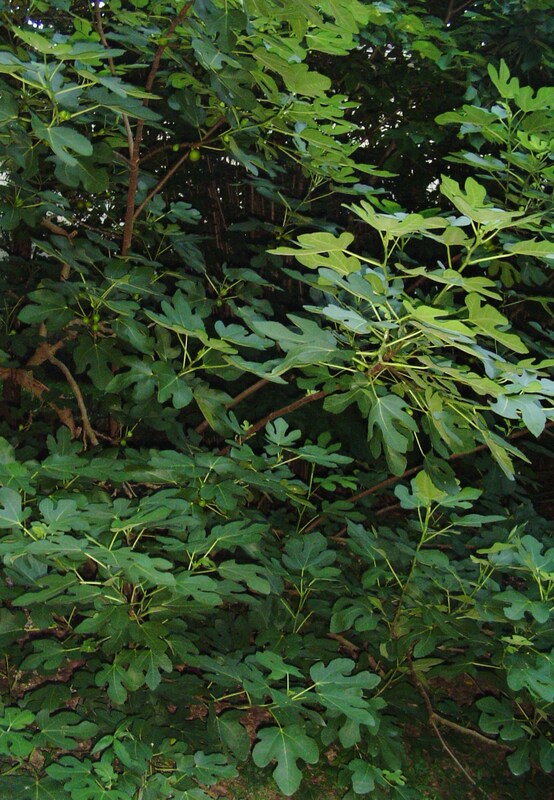 BUT, the deer have been molesting the fig trees this year, grazing leaves and ripping stems and branches. 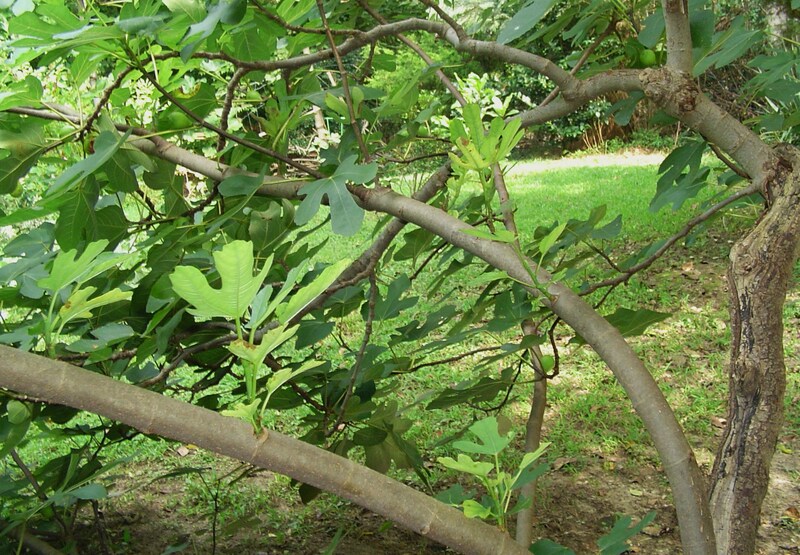 This fig tree grew so much in spring that its branches toppled over, changing the shape of the entire plant. New branches have sprouted along the now horizontal fallen branches. It grew quickly with the abundant rain, and was knocked over by the windstorms in June. I gave pieces of one of these broken branches to some gardening friends, who rooted them successfully, and now have small trees. 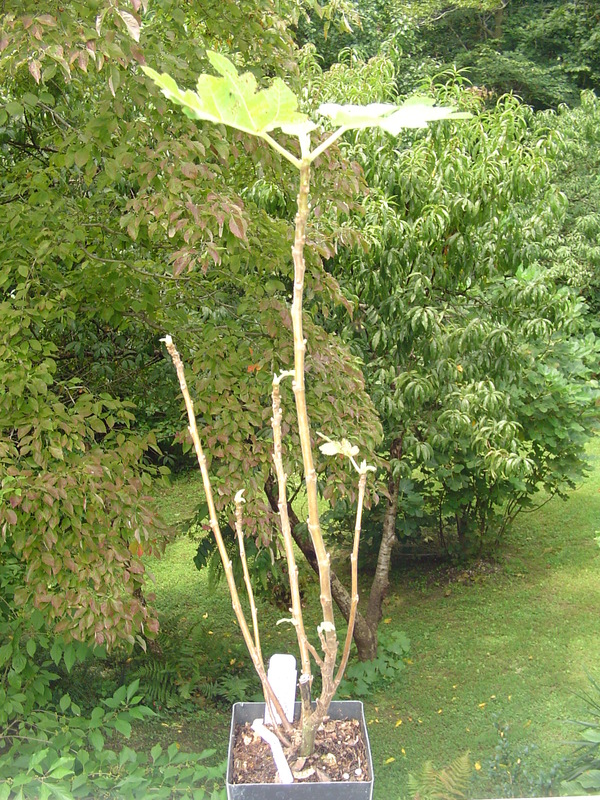 The tall, heavy branches, fallen over in early summer, are sprouting new vertical growth. This beautiful tree just keeps getting bigger and bigger. Visiting a fig loving friend yesterday evening, I commented on her ripe figs. We looked more closely. Her small bush, covered in ripening figs only days ago, had only two little figs still attached. We found the gaps where squirrels had gotten in through her netting. A well protected fig in my friends garden, still was robbed by a squirrel who found an opening in the netting. We have just received two new “SIlver Lyre” fig trees from Plant Delights. This is a newly offered variety of Afghan Fig. I like the beautiful, lacy silver-toned leaves. These are advertised to grow quickly to a 20′ shrub, and I plan to plant them in the newly sunny area of our forest where the oak trees fell this spring. An Afghan Fig, newly arrived in the mail, ready to pot up. They will quickly provide a bit of privacy from the street, but will never grow tall enough to create a hazard. In fact, they are supposed to be very sturdy in wind. 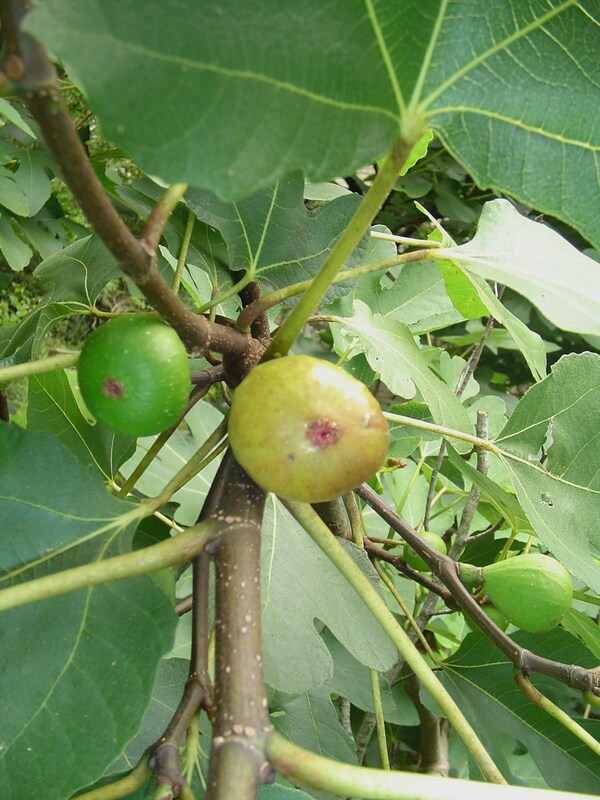 I hope to one day harvest a few figs from them… If I can manage to keep the squirrels away. Rick Austin, in his book, Secret Garden of Survival, describes a method of planting a “guild” of plants around a new fruit tree. 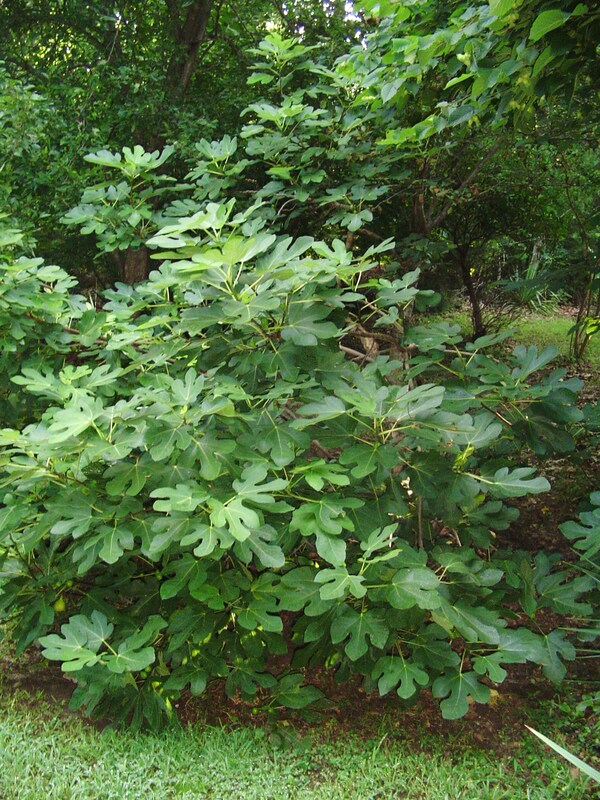 Some of the plants bring up nutrients from the soil, some are good companion plants for the tree, and some plants protect the newly planted tree from critters. Not brave enough to plant an apple or persimmon, which I KNOW our squirrels would strip, I plan to try his method when planting these figs later in the fall. 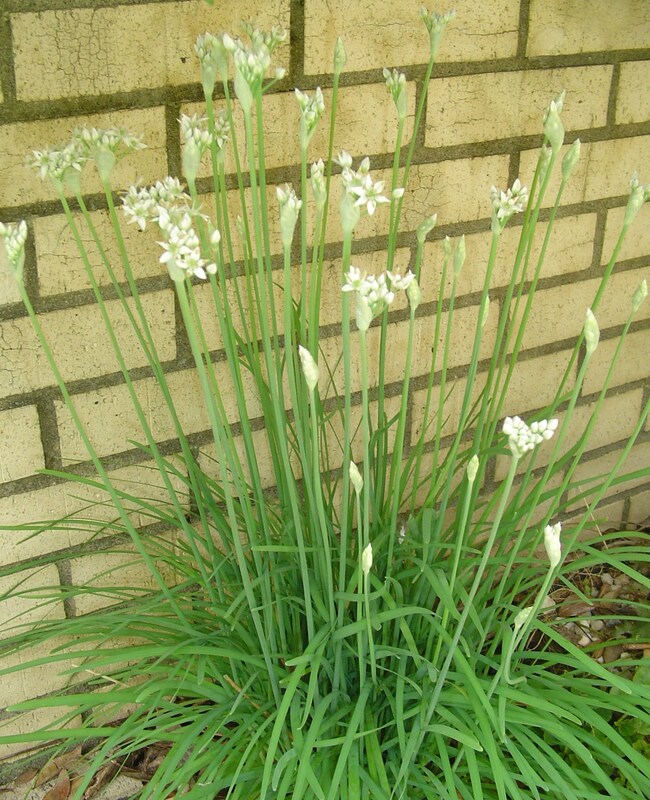 I’ll surround the new figs with daffodil bulbs to create a wall of poisonous bulbs and roots against the voles, garlic or garlic chives to slow down the deer, and perhaps some Comfrey to enrich the soil and create that extra wall of distraction for the deer. They never touch my Comfrey or garlic chives, both of which attract bees and butterflies. 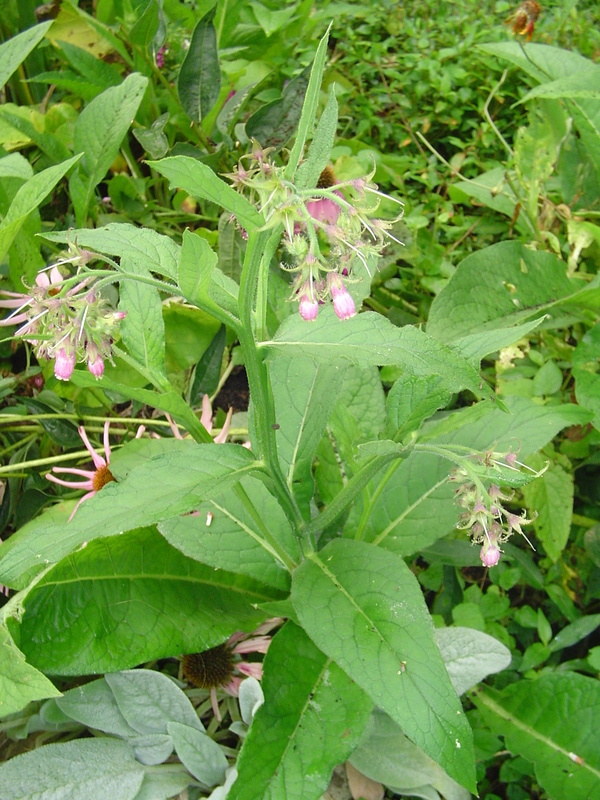 Comfrey, a perennial herb with tremendous healing properties, is an excellent herb for improving the soil. Its long tap root brings up nutrients from deep in the Earth. Its leaves are an excellent addition to compost to build fertility. These little trees will go into pots tomorrow to let them grow a bit beefier before I plant them out in the garden, after the first frost, probably in December. The growers at Plant Delights had tremendous growth in their first year with “Silver Lyre”, and I will hope for the same results so these new trees fill out quickly. They will grow quite wide, as figs do, so the guilds will extend several feet out from their trunks. This will be an interesting process to watch unfold in the forest garden. 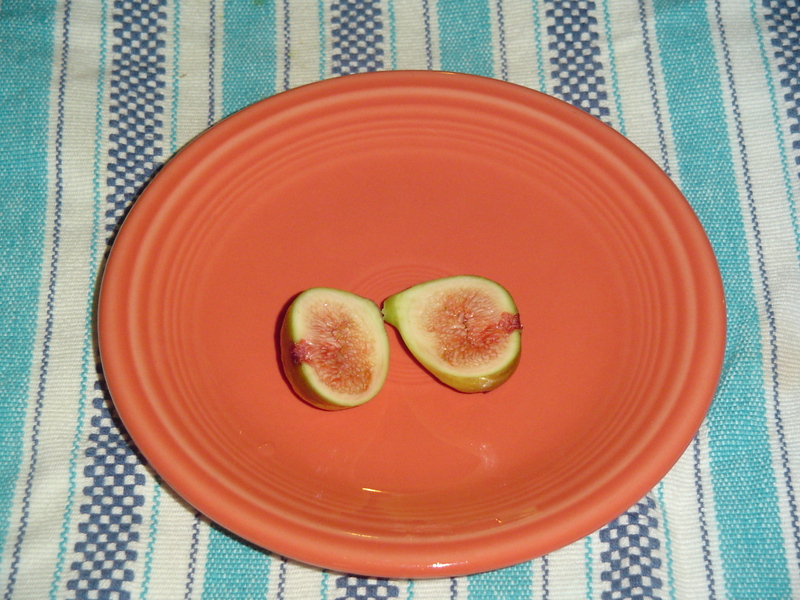 Here is my favorite “Pickled Fig” recipe developed last autumn. I made several batches, tweaking the recipe each time. I’m hoping there is a large enough harvest to make them again in a few weeks! 1. Measure the sugar into a dutch oven, add 1 c. of water, and turn on medium heat. 2. Wash and trim the figs. Place in a large ceramic bowl. Sprinkle them with baking soda, and cover with boiling water. Allow to soak for 10-12 minutes. 3. Wash and thinly slice the lemons. Halve or quarter the slices, catching the juice. Julienne the end pieces, which are mostly peel. Add fruit and juice to the sugar mixture, along with the spices, Sangria, vinegar, and washed peppers. 4. Rinse the figs in cool water, peel off any discolored skin, and slice the figs in halves or quarters as they are added to the sugar, lemon, and spice mix. 5. Simmer, stirring occasionally, for 30 minutes; allowing the syrup to thicken and the lemons to become translucent. 6. Allow the mixture to sit, covered, for 12 to 24 hours. 7. Reheat to boiling and can in glass jars. I have never seen a “pickled” fig recipe—I’ll definitely try this out! We generally either give away or freeze the figs because so many are produced in about 6 weeks time. (This year, we had well over 75 pounds!). Thanks for sharing your recipe! Congratulations on your wonderful fig harvest. What kind do you grow? I hope you’ll enjoy the fig pickles. You can also make fig preserves with a few adjustments to the recipe, leaving out the vinegar and wine, adjusting the spices, and increasing the sugar a bit. You might also try using the McCormick pickle spice blend (cloves, cinnamon, bay, etc. whole spices) to see if you enjoy that in your fig pickle. I hope they turn out well for you. They are nice served with a soft cheese as an appetizer or snack. 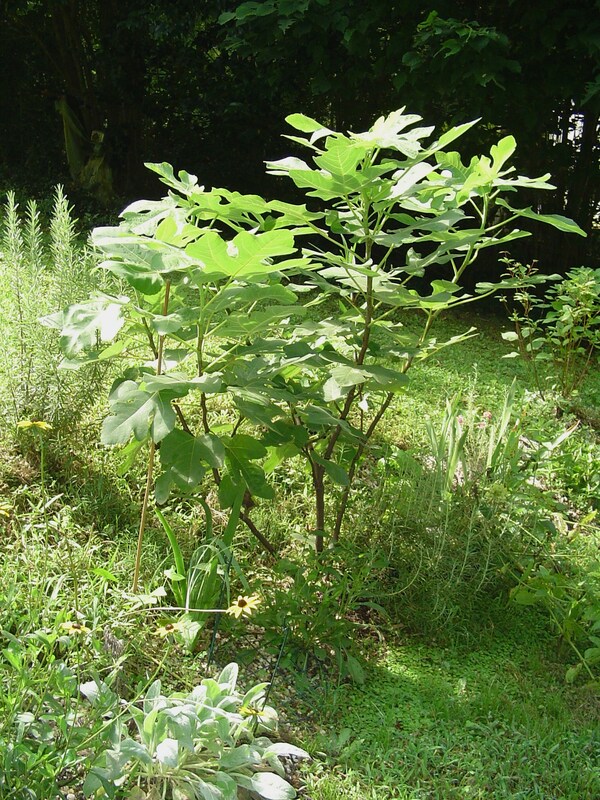 I believe the figs are the Alma variety; my husband planted celeste, brown turkey and alma–only one survived and he didn’t leave tags on them. 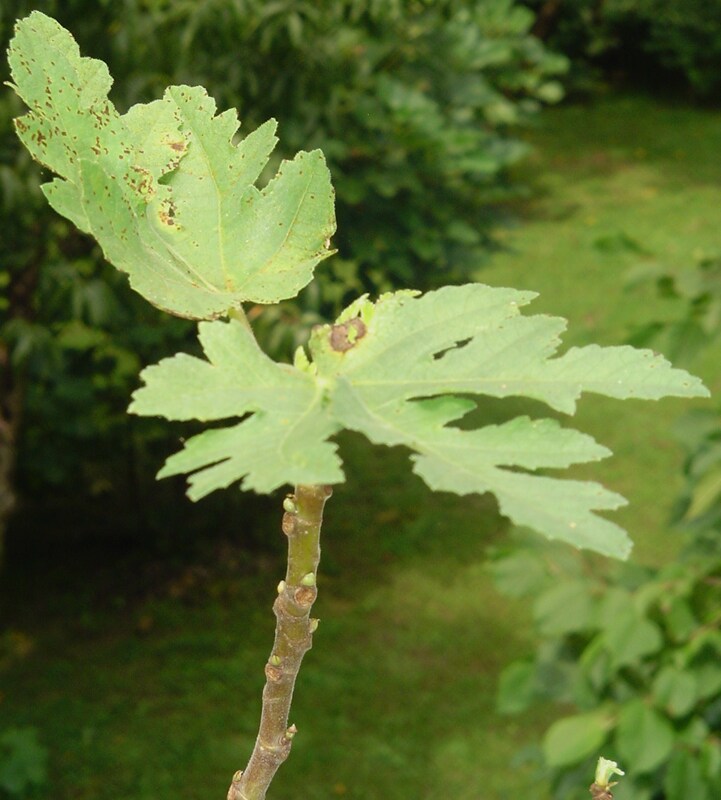 I think it’s alma because of it’s growing patterns (figs on new growth, production during July/August, color and shape of figs). 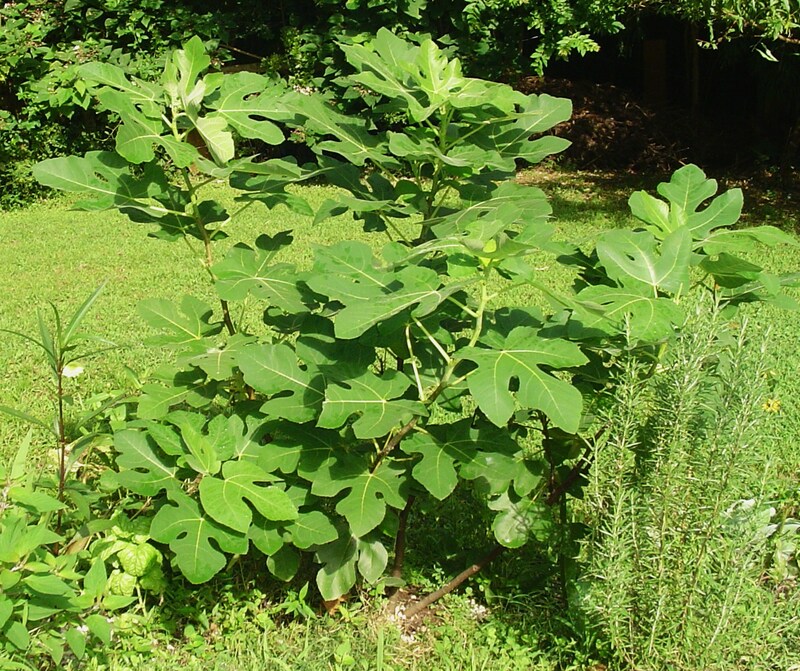 This fig produces figs almost continuously from mid July through August, then they stop growing as the heat and bugs take over. 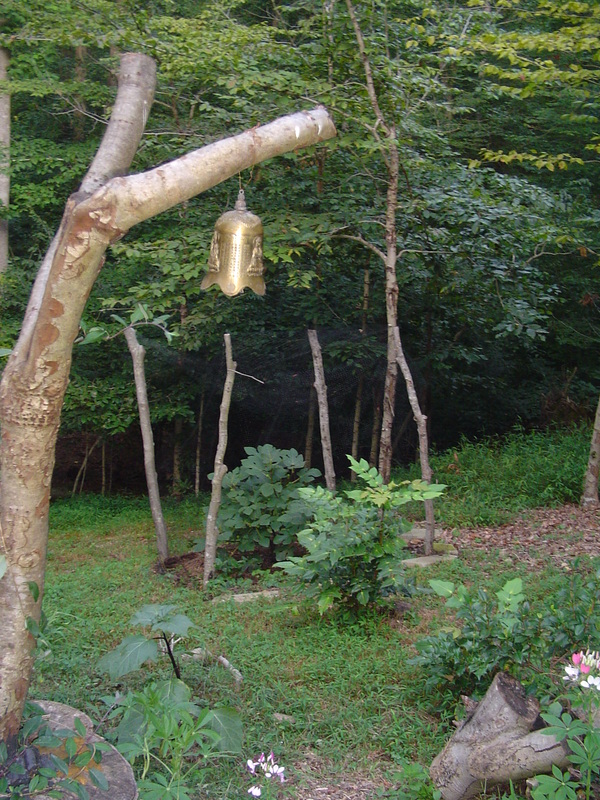 The tree is at the northeast corner of the barn by the down spout, so it is watered every time it rains and there’s a thick sand layer around the tree roots. We have no problem with birds as we have two barn cats. I’m so sorry to hear the blackbirds get to your figs. The fleece is an excellent idea for protection from the birds. Last year I got plenty, even though a few were inadvertently “shared” with the critters. I’m hoping to have enough to share with friends again this year. I’ll try the fleece on some of my smaller bushes next season. I’ve also read that tulle can be used, but haven’t tried it.